Old Norse poets filled their literature with epic battles, speeches, and feasts. Emphasis on the latter, because they focused on family first and foremost (and what brings together family better than a giant slab of roast mutton, are we right?). These legends, called sagas, told stories of valiant Vikings and their brothers, and their father, and his father, and his brothers, and his father who vanquished an old mother-son monster duo. It went something like that. 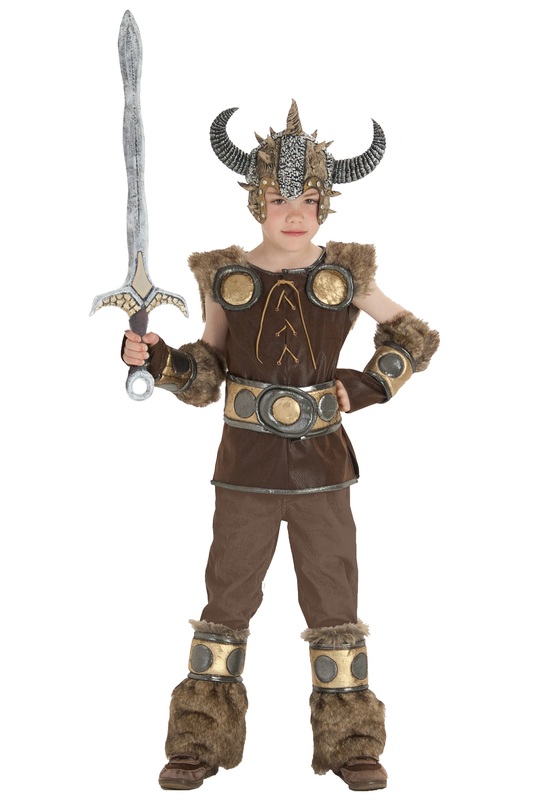 We have it on good authority that the Norse conqueror of legend Ragnar Lodbrok would be proud to see you passing his traditional garb to the new generation—continuing his legacy like those old poets—with this Viking Costume. You might as well be prepping your little one to board his wooden longship and mount a piratical raid on the British Isles. Or for a Vikings football game—whichever he's into, really. Whether munching on bratwurst at a tailgate party or sailing the vast blue—and assuming you pair it with a sword and helmet—your little Viking will never be unprepared with this Viking Costume. Cool faux leather arm cuffs are lined with gold and silver, matching the gold foam belt with silver trim. Perhaps more importantly, faux fur lines the shoulders and arms for extra warmth while either on the seas or out for a Halloween hunt for the neighborhood's candy. Go make Ragnar proud!